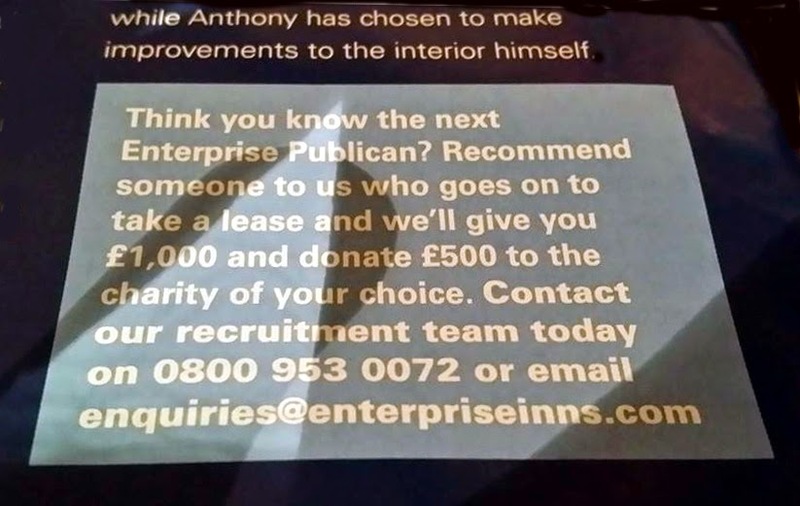 "While Anthony has chosen to make improvements to the interior himself" we expect those improvements Anthony has made to add at least forty five percent to our income from the pub which Anthony regards as his own. We are able to be certain about these issues because Anthony does not perfectly understand the relationship between the contract he believes he signed and Our reality, which is that His pub is in fact Our pub and everything Anthony does to Our pub is Ours, in perpetuity, and any increase in income derived from Anthony's investment, financial, physical and emotional, his activities and entrepreneurial endeavour is, quite simply, Ours. Thanks to Anthony's friends who introduced him to us we are able to donate £500 to a charity of their choice. We take that, and the £1000 introductory softener, straight out of Anthony's deposit so there will be no delays to Anthony's becoming Bonded to US until such time as We have taken all Anthony's assets which became Ours with his signature on the Traditional Lease Guarantee, which, although his Solicitor told him 'Do Not Sign This Lease' he chose to tick the box indicating he chose not to seek legal advice because he wanted Our pub so much he lost all rationality in his determination to become an Entrepreneur with a Big Business Partner like Us to back his industry and hard work. Some people in Great Britain, principally Tied Publicans with a little more experience of Bonded Labour than Anthony, who's currently too busy putting all his energies into keeping his customers happy and protecting Our long term income prospects, label this state of affairs 'The Great British Pubco Scam'; We on the other hand, being sophisticated business people who are better placed to judge these things, call it the beautiful Spirit of Free Enterprise. Good article and spot on synopsis.